Dr. Congeni received his medical degree from The Ohio State University College of Medicine. He completed his pediatrics residency at the University of Michigan Medical Center and C.S. 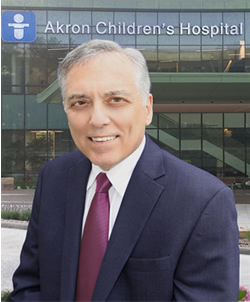 Mott Children's Hospital, and his pediatric infectious diseases fellowship at Case Western Reserve University and Cleveland Metropolitan General Hospital. Dr. Congeni is board certified in pediatrics and pediatric infectious diseases. A member of the American Academy of Pediatrics, Infectious Diseases Society of America, and American Society of Microbiology. Dr. Congeni has been named in the Best Doctors in America for more than a dozen years. He has been the recipient of numerous faculty awards including Leibelt-Wheeler, 1999, Legendary Service, 2013, Golden Apple Award for teaching excellence 6 times, honorary hooder by the graduating class 4 times, and he was elected Master Teacher at NEOMED, class of 2000. Dr. Congeni serves as an editorial board member for Infectious Diseases in Clinical Practice , and he is a past editorial board member for Concise Reviews of Pediatric Infectious Diseases. He has authored more than 60 abstracts, book chapters, and peer-reviewed medical journal publications, and he has served as a guest editor of Pediatric Annals.